These were my Easter painted eggs. I know, it is a week since the orthodox Easter has gone but with all the things I had to do lately, I had no time to publish them. We (in Romania) do painted eggs every Easter. 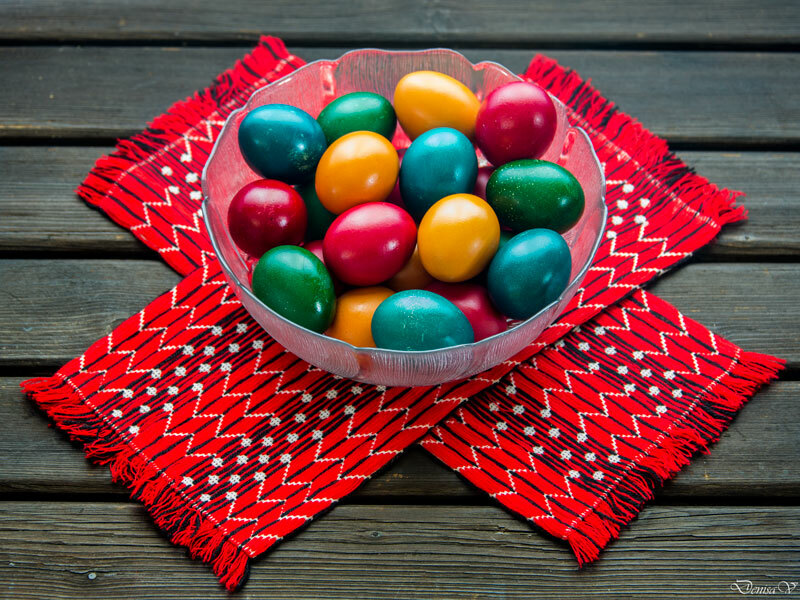 Years ago we were painted eggs only in red to symbolize the blood of Christ but as this holiday is not just a religious one but also a commercial one, it became very popular to paint eggs in all colors. Here in Belgium, to paint eggs is an activity for kids. Back in Romania is a serious business as everybody does it. Of course kids loves this tradition the most but we also do very artistic patterns on the eggs and I could even find them in the airport as souvenir for tourists. When I was a kid, I tried also different techniques like putting the egg in an old fine stockings with a parsley leaf inside before submerging the egg in the paint. Other times I tried to paint them with wax. Back then, it was just a play and I was enjoying very much being creative with painted eggs. Now, I do not have the the time to play anymore but this doesn't mean that I do not paint eggs. To do this you need to buy egg paint which, to be honest, I brought it from Romania. Some years ago I bought from here (Belgium) some paint for eggs, but it was for kids to play not the type I was looking for. The paint for eggs should not be toxic, should not be transferred to the egg white and should not remain on your hands when you peel the egg. So, if you want to paint eggs find a dedicated paint. Another challenge I faced here where the eggs. To have beautiful colors, you need eggs with white shell. I was looking here for these types of eggs in all shops without success. I asked once a shop seller where can I find eggs with white shall and the answer was that white eggs are considered inferior so I won't find them for sale and that most of the hens and doing mainly red-yellow eggs. That was strange for me ... especially because I remember the eggs I was collecting from my grand mother hens when I was a child and finding an egg that was not white was a real event. Well, I have no clue what is the real reason behind the current situation in Belgium of selling only orange eggs but I had to accept it and paint the eggs I have found to buy. egg paint. I had 4 colors, that usually you find for sale in one box. Wash the eggs with soap and warm watter to remove any stamp or dirt. Boil the eggs for 7 minutes. Pour the hot water and put cold water on them immediately. This will help the eggs to peel easily. Let them in cold water for 5 minutes and remove them on a towel. Now, you'll need to follow the instructions given on the box of the paint. In my case, I boiled 700ml of water, add 7 tablespoons of vinegar (7º) and the paint. I have sunken the eggs in paint for 4 minutes and removed them on a paper towel to dry. Repeat the same for the rest of the colors. When the eggs are dried, oil them with a cloth moist in oil. This will make the eggs to shine! There are ways to paint eggs in a natural way. Boil them in onion skin and they will become yellow. Boil them with red cabbage and they will become dark blue. Submerge them in beetroot juice and they'll be red ... and so on. You will not obtain the same vibrant colors as with an artificial paint but if you want to stay fully natural it worth a try.